Make a project about Graduation. Two My Sentiments Exactly sets-Brand New! My niece is graduating from High School this year, and I wanted to make her a cool card, so I started off with the star tag from the Fabulous Finds cartridge - free this week. I used some shiny red cardstock and then embossed it with a Tim Holtz shattered glass embossing folder from Sizzix, using a bit of Black Distress Ink to highlight the embossing. I smooshed on some Tattered Angels Black Magic, Iridescent Gold and Bronze Glimmer Mists onto the white cardstock panel that I had used the Write feature and the Cricut Signature Script Font on to spell Graduation. Then, I used a silver gel pen to fill in the spaces of the word. One of the reasons I love my Cricut Explore is being able to search a PNG file while on my iPad, save the photo and upload it to the Design Space app! I did just this with the cute grad cap image - using Online Web Fonts which has tons of free images available for download. 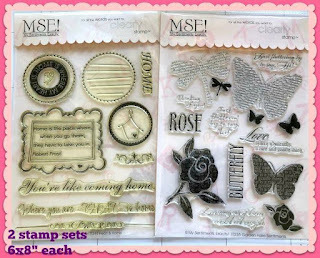 The Happy cut is from Scrapbook and Cards Today, a bonus with the SCT Sampler! I cut it from a striped patterned paper and then covered it with Stickles to give it lots of shimmer. Thanks so much for stopping by! Be sure to head over to the Fantabulous Cricut Challenge Blog to see what all the other designers have come up with for this challenge - and enter your own for a chance to win! Scrap Shotz May 2018 Kit - Spring Home Decor Tag! Hello! I'm so happy it is Spring! 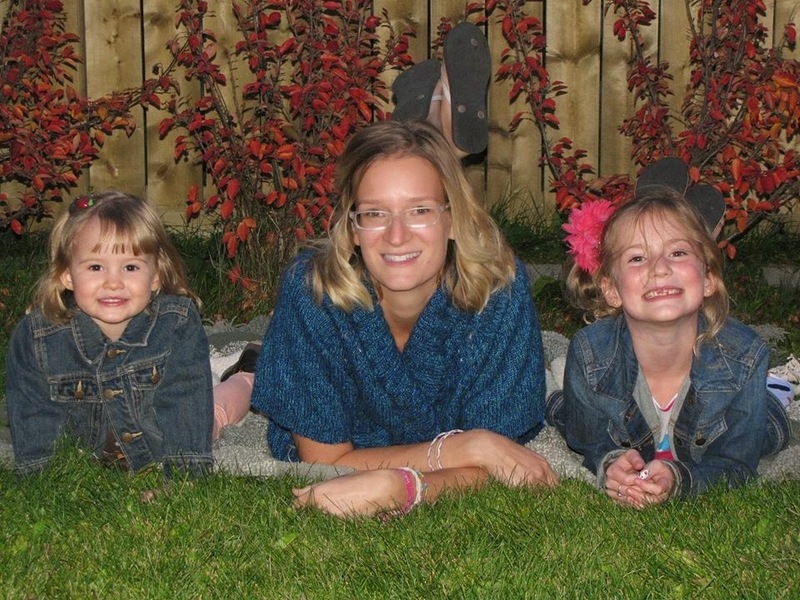 We've had such a long winter and are finally having a few nice weeks of gorgeous weather... 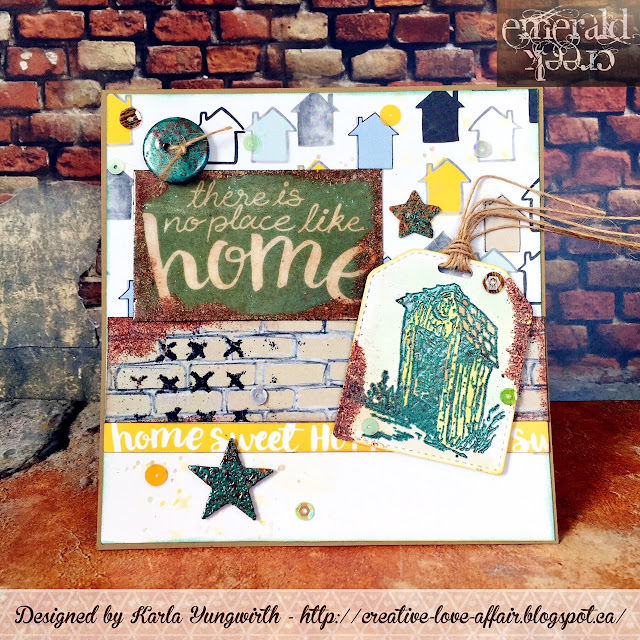 So, I was really excited to create a bright and fun piece of Spring home decor with the Scrap Shotz May Kit using the Tim Holtz Etcetera Thickboard tag, which is included in this month's kit! I just love all the layers and colours this tag has!! Be sure to pop over to the Scrap Shotz Blog to see the steps I used to create this tag as well as some closeups and all the details. You can find the Scrap Shotz May KIT and any fun ADD-ON's in the store. Thanks so much for stopping by, and have a wonderful week! Hi friends! 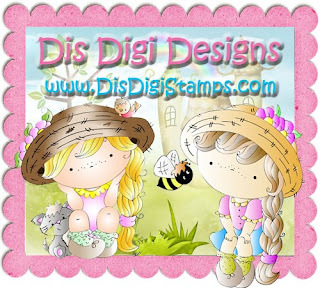 I'm sharing an adorable card today on the Kitty Bee Designs blog using the sweet Laptop Panda Girl digital Stamp from Kitty Bee Designs. She is just so cute!! I coloured her with Jane Davenport Magic Wand coloured pencils, which are so soft and creamy - a dream to blend! 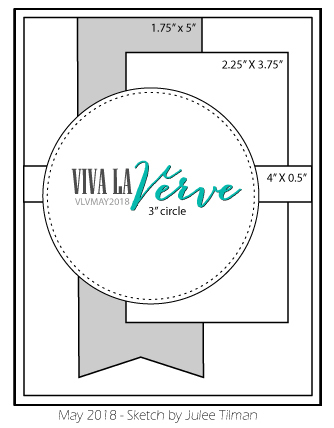 I cut out the image as well as a coordinating mat with a nested die set and then used the SCT May Sampler pack goodies to create a background using the Viva La Verve May sketch as inspiration (see sketch below). I fussy cut the Hello's out of one of the Pink Fresh Studio patterned papers included in the sampler - they totally made me think of the Beatles song - Hello, Goodbye! I added some gorgeous SpiegelMom Scraps sequins and used Glossy Accents to give a cool effect to her glasses and the little hearts. P.S. 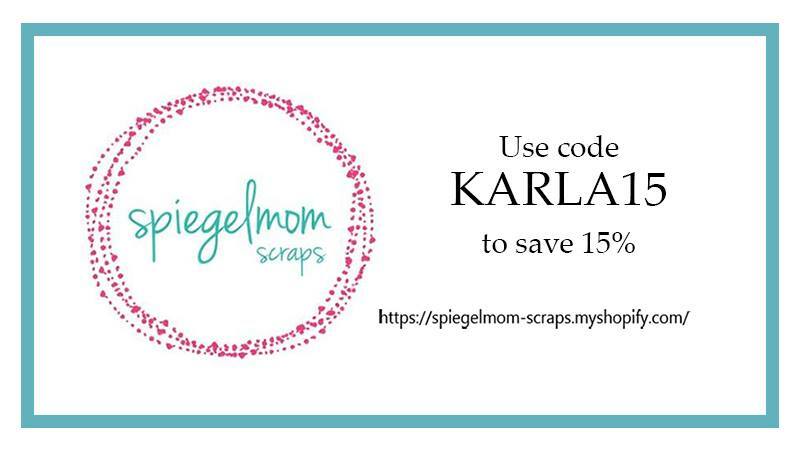 You can still use the code KARLA15 to save 15% off at the SpiegelMom Scraps shop!! Thanks so much for stopping by! Be sure to check out the Kitty Bee Designs Etsy Shop where you can find this cutie and many more sweet stamps, and don't forget to check out our current challenge on the Aloha Friday challenge blog for your chance to win a prize from our awesome sponsors. 7gypsies Handmade Junk Journal & Video!! Hello! I'm so excited to share my first junk journal! I have wanted to make one for a while, and I'm really glad I finally did it. The Canvas Corp Brands Architextures books are just the perfect thing to start with, and since I had my niece's birthday coming up - and one of the Vintage Pink books in my stash - I thought this would be the perfect thing to create for her! Here's a look at some of the pages I ended up with. 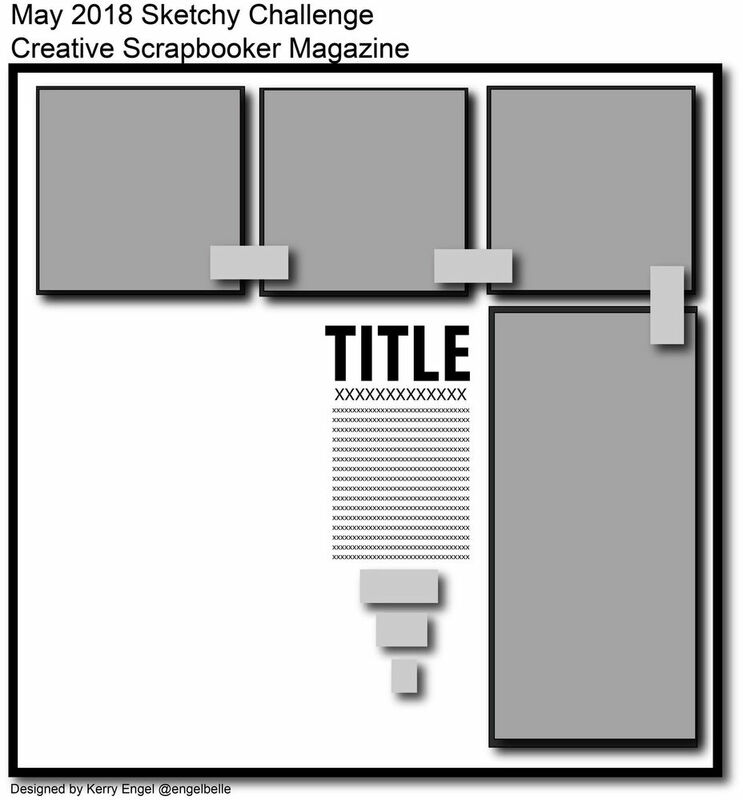 The beautiful background papers on the pages included with the book made it easy to create a great layout! Be sure to check out the video below to see all the pages closeup. Here's a link to the video (or watch below) where you can get a closeup of the 7gypsies Architextures Mix & Match Vintage Pink book - and then see all the pages I created with lots of goodies from the Canvas Corp Brand Shop! To see a list of supplies visit the video and check the description box. 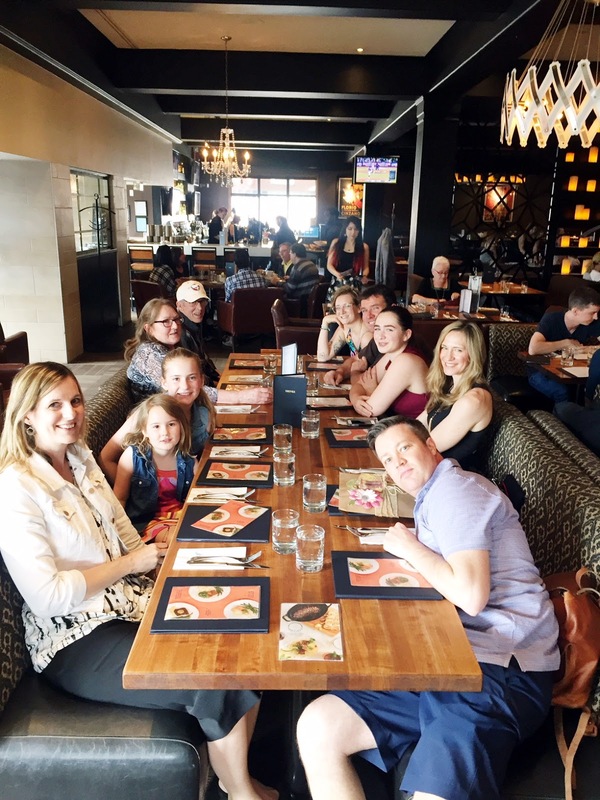 Here's a photo of us all at the table at our local Earls restaurant! Of course Sydney loved her gift!! Thanks so much for stopping by! Be sure to check out the 7gypsies YouTube channel for lots more inspiration! Scrap Shotz May 2018 Kit - Unboxing & Two Layouts with Video!! Hi! 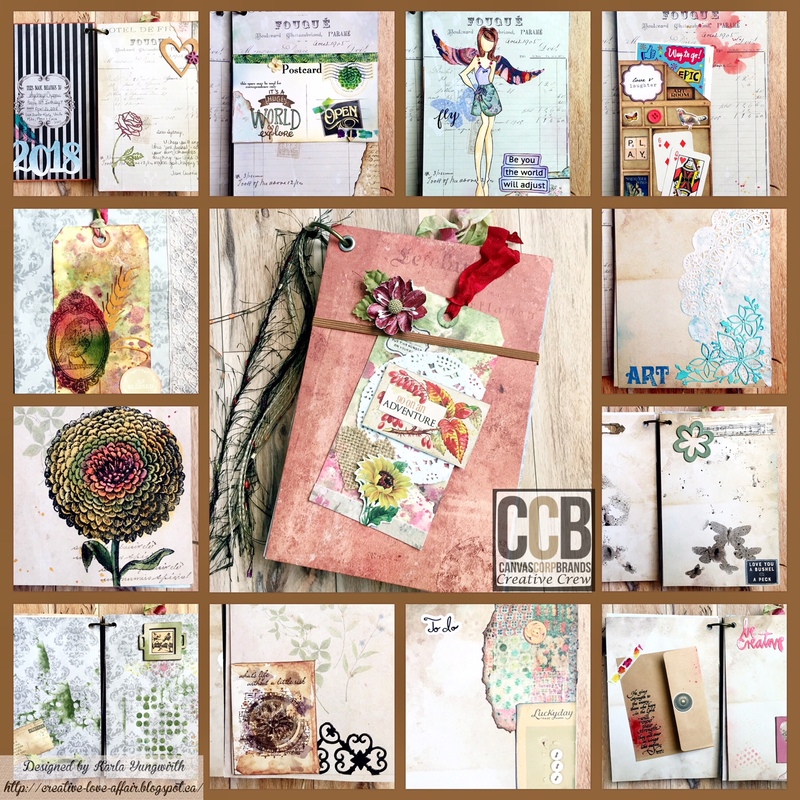 I'm always super excited to see what's in the Scrap Shotz Monthly Scrapbooking Kit, and this month they are featuring the beautiful Kaisercraft Pen & Ink collection along with some other fabulous goodies! I've created two pretty baby layouts using the papers in this collection and I just love how they turned out! I added some light Distress Ink and Oxide colours and for the first sketch I used the Creative Scrapbooker Magazine Sketch for May. The neutrals matched my photos so perfectly! For my second layout I layered the diecut Frame paper on a piece of the patterned paper and really love how this turned out! All the kit elements coordinate so beautifully for a gorgeous layout, and a few SpiegelMom Scraps sequins add a bit of bling as a finishing touch! Thanks so much for stopping by! 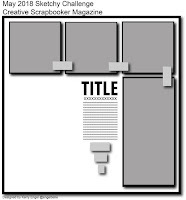 Be sure to head over to the Scrap Shotz store to order your KIT and any fun ADD-ON's and you can see closeups of both layouts as well as the contents of the kit on the Scrap Shotz blog HERE. 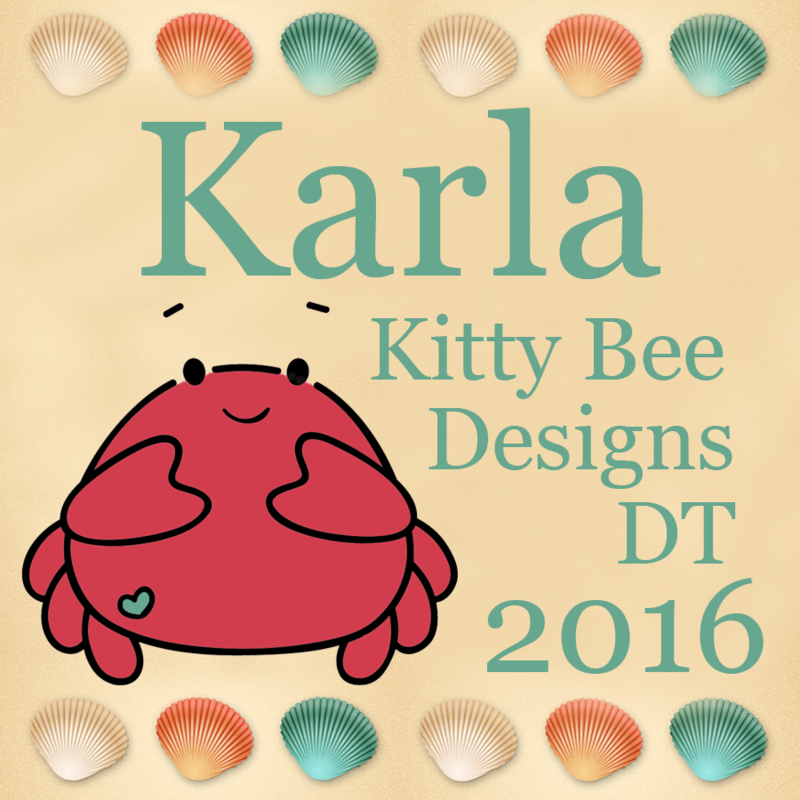 Kitty Bee Designs #118 - For Mom/Feminine! Hi Friends! I hope you've been having a lovely week so far! I've had lots of fun creating projects lately and here's one more for you! 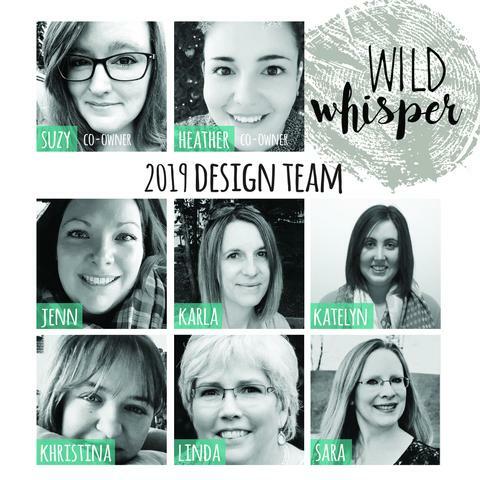 It's time for the midweek inspiration for Challenge #118 - For Mom/Feminine- over at the Kitty Bee Designs Challenge Blog - Aloha Friday! Today I'm using the beautiful Sentiment Flower Doodledallion set from Fred She Said Designs, which comes with digital outlines, printables, sentiments and precoloured versions of layers that you can put together in so many ways! I printed out the printable sheet with the square background and several flowers and then I fussy cut each flower to size and sponged on Distress Oxide Inks to give each layer a varied look. I used my new favourite mist - Tattered Angels Chalk Chalkboard Mist, which is a white, semiopaque mist that has a beautiful shimmer, to lightly mist all over my coloured pieces before layering them with foam tape. The Oxide Ink reacts with the mist, but also protects the printed image and my ink did not run at all! I used a new Altenew Scallop Builder stencil to layer on Ivory and Pink Distress Oxides on a kraft background. These builder stencils are so fun!! Next I cut out various flowers and stems from my Tim Holtz Funky Floral #3 diecut set using supplies from previous Scrapbook & Cards Today Sampler Kits. I added a bit of white gel pen for detail and added some sequins and enamel dots from the kits. Lastly, I added a cork butterfly from SpiegelMom Scraps, which they sadly don't carry any more, and then layered a wooden butterfly overtop that I altered with Emerald Creek Charred Gold embossing powder. I love how it changed the look! Emerald Creek Craft Supplies - Guy Style Congrats Card! Hi friends! I'm back today for the Emerald Creek Blog to share my take on our May Challenge theme - Guy Style. 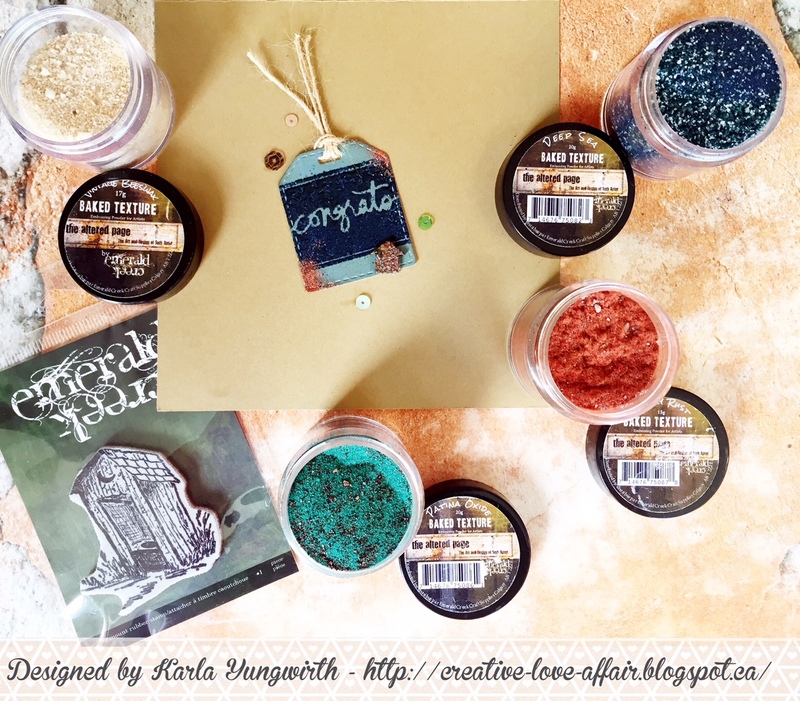 I created a New Home Congrats card with a masculine feel using the new Baked Texture Embossing Powders from Emerald Creek, the Emerald Creek Out The Back Door outhouse stamp and papers from the Wild Whisper No Place Like Home collection. I used my Distress Oxide Inks to watercolour the image in after embossing with the Patina Oxide powder. Then, the Chunky Rust added a vintage rusted look to the diecut Your Next Stamp tag. I added that wonderful Chunky Rust powder again to the No Place Like Home card and then coated the whole thing with Vintage Beeswax powder. It's amazing how much it actually looks like a rusted metal vintage sign! Inside, I added an embossed sentiment stamp using Deep Sea and some SpiegelMom Scraps Sequins. These powders are so amazing to work with! They are great for embossing stamps or altering your embellishments - like I did with the button and stars on the front of the card and the little arrow I turned to be a house on the inside tag. Thanks so much for stopping by! Be sure to check out all the awesome Guy Style projects and challenge details at the Emerald Creek Blog and join us with your own project for a chance to win! 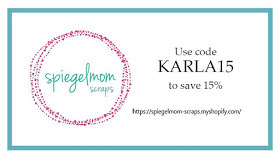 You can even save 10% just for entering!! Hello! I'm back today to share a Father's Day card using Pinterest as inspiration. A friend came over last week and we chose a card we liked the style of and spent the morning doing a little crafting. I layered some Canvas Corp Ivory Cardstock and some black cardstock over a kraft cardbase cut to a 5 1/2" square. Then I used a black and white print from the Canvas Corp Black and Ivory 5x7 paper pad (there are so many options with the B&W prints) and added some SpiegelMom Scraps Natural Burlap String, a button, and some leafy diecuts from the newest Tim Holtz Funky Floral Set 3. I found an older CTMH stamp set that included the sentiment and timepiece stamp so I used Distress Oxide Ink and spritzed it lightly with water before stamping the watch to create a slightly watercoloured look. I also splattered some ink with a paintbrush onto the background and then stamped the sentiment with Archival Black Ink. I used a bit of Ivory paint to coat the grooves of the metal embellishment before adding it on top of the card. Inside I stamped a simple Father's Day sentiment. Thanks so much for stopping by! I hope you have a fantastic week and get a little crafty time to play this week! 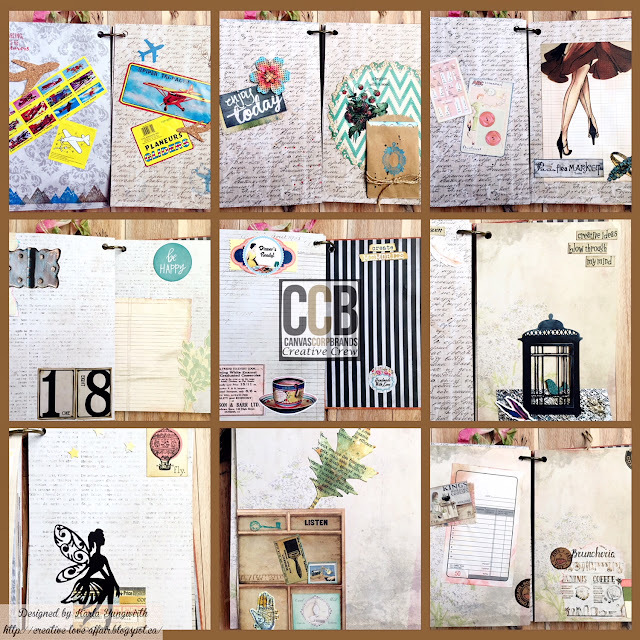 7gypsies - Using the Architextures Stash Paque in Your Planner VIDEO! Hi there friends! 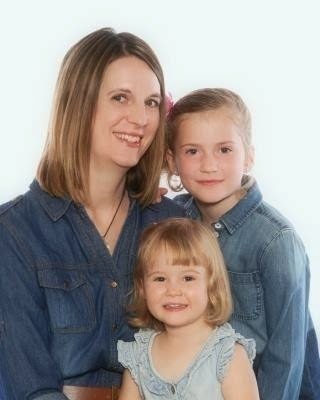 I hope you've all had a fabulous weekend. I was lucky enough to get some scrapbooking done at a crop on iNSD (International Scrapbooking Day) on Saturday, which was totally awesome! Today, I'm sharing a video I have posted on the 7gypsies YouTube channel - Using Architextures 'Create' Stash Paque In Your Planner. The Stash Paques are full of vintage stickers, cut aparts, adhesive sheets and more that can be used for so many things! 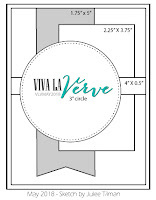 I wanted to show you how you could use it to decorate a planner today. Here are some pics, but you'll want to watch the video below to see it closeup! Click HERE to watch the video or on the link below to get a closeup look of all the awesome goodies included in the 7gypsies Create Stash Paque and see how I included them in my planner! FCCB #325 - Mother’s Day! For this week's challenge I've created a pretty Mother's Day card using the Kim Byers Mother's Day Cricut cartridge in Design Space for the gem diecut and the inside sentiment, free this week 😉and a free card cutfile from SVGcuts - Mia's Card. 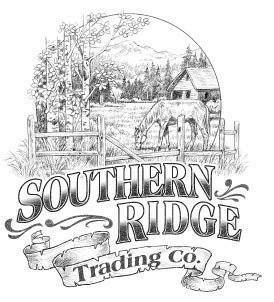 There are so many amazing freebies to check out from our awesome sponsor!! I first used Canvas Corp Ivory cardstock to cut all my diecut pieces, and then used Distress Inks to create an ombre effect for the background. I sprayed Tattered Angels Mists and added Tattered Angels Glimmer Glam for lots of pretty shine to the top cut of the card base. If you chose to heat the Glimmer Glam it bubbles, and I love that effect! I cut the back of the gem from a blue foil paper and then added Emerald Creek Hammered Metal Embossing Powder to the top cut for a lovely metallic effect. I sprinkled SpiegelMom Scraps sequins around for the finishing touch. Inside, I used a Pretty Cute Stamps Mother's Day sentiment along with the You're A Gem diecut from the Kim Byers cartridge. I cut it out of the vanilla cardstock, sprayed it with Tattered Angels Mists and then gave it a top coat with Emerald Creek Fractured Ice embossing powder. And, in case you're wondering - the background papers I used in my photos are from the 7gypsies Architexures paper line. I love the vintage look they give! Thanks so much for stopping by today! I hope you have a fantastic week ahead!! Be sure to stop over at the Fantabulous Cricut blog to see what the other Design Team members have come up with for this challenge, and enter your own Mother's Day project with at least 1 Cricut cut for a chance to win a fab prize from SVGcuts!